Of all food thermometers, thermocouple thermometers reach and display the final temperature the fastest - within 2 to 5 seconds. The temperature is indicated on a digital display. A thermocouple measures temperature at the junction of two fine wires located in the tip of the probe. 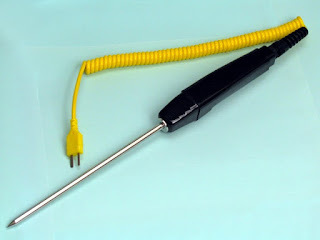 Thermocouples used in scientific laboratories have very thin probes, similar to hypodermic needles, while others may have a thickness of 1/16 of an inch. Since thermocouple thermometers respond so rapidly, the temperature can be quickly checked in a number of locations to ensure that the food is safely cooked. This is especially useful for cooking large foods, such as roasts or turkeys, when checking the temperature in more than one place is advised. The thin probe of the thermocouple also enables it to accurately read the temperature of thin foods such as hamburger patties, pork chops, and chicken breasts. Thermocouples are not designed to remain in the food while it's cooking. They should be used near the end of the estimated cooking time to check for final cooking temperatures. To prevent overcooking, check the temperature before the food is expected to finish cooking. Thermocouples can be calibrated for accuracy. For more information of food industry thermocouples, contact Duro-Sense Corporation by calling 310-533-6877 or visiting https://duro-sense.com.